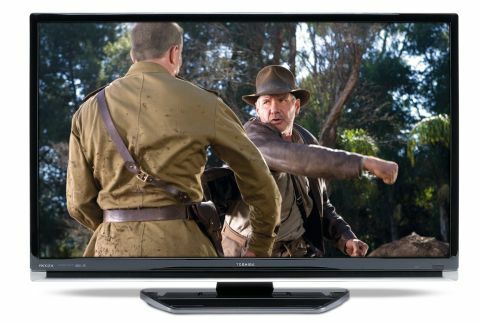 If you'd love to have a 40in TV but don't think you've got the space for it, check out this model from Toshiba. This amazing-looking 40in set employs Toshiba's Picture Frame technology to deliver a bezel measuring just 23mm across. This means that not only do you end up with a stunningly stylish screen that seems almost to hang freely in space, but you also get a 40in TV that occupies the same area as a typical 37in model. Reluctantly dragging our eyes from the 40ZF355DB's sumptuous front, it's nice to find a generous socket collection around the back. This includes, among other things, three v1.3 HDMIs, a component video input, a PC port and, unusually, a subwoofer line out. Aside from its remarkable design, the 40ZF355DB's most eye-catching feature is its Active Vision M100 image processing. The Active Vision part refers to a suite of processing measures aimed at colours, black levels, motion handling, detailing and noise reduction that has delivered mixed results on recent Toshiba TVs. So it will be interesting to see how it fares here. The M100 part of the name, meanwhile, refers to a 100Hz element designed to make moving objects look sharper, avoiding LCD's normal blurring problem in the process. Other features worthy of note are the option to deactivate the TV's dynamic backlight system (which helps the screen to achieve a phenomenally high claimed contrast ratio of 30,000:1); and a 'Film Stabilisation Mode' that provides three levels (off, standard and smooth) of motion smoothing. With HD material, the 40ZF355DB's pictures occasionally look quite spectacular. Colours, for instance, are remarkably vibrant and richly saturated, driving colourful scenes off the screen with almost frightening intensity. The picture is also extremely bright, even after toning down the set's crazily OTT factory presets. What's more, although black levels aren't the best in this group test, they're pretty decent considering how much brightness they're up against. This combination of good dark areas and extreme bright areas helps the picture achieve some terrific dynamics. A final plus point is that HD sources can look exceptionally detailed, especially with relatively static content. However, we did spot a couple of significant problems during our tests. First and worst, no matter what 100Hz or film mode setting we used, the picture seemed to flicker - almost pulse - to a really quite distracting degree. We also found the set's standard-def pictures a tad suspect, with gentle smearing and some over-stressed edging during mid-range and distance shots.